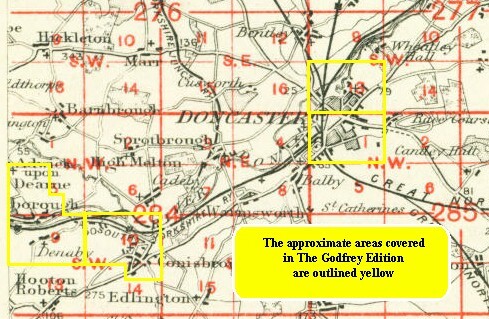 This is our coverage of Doncaster, historically part of the West Riding of Yorkshire. Today's Metropolitan Borough of Doncaster dates from 1974 and the amalgamation of the County Borough of Doncaster with Adwick le Street Urban District, Bentley with Arksey Urban District, Conisbrough Urban District, Mexborough Urban District, Tickhill Urban District, Doncaster Rural District and Thorne Rural District. At the same time it became part of the new South Yorkshire Metropolitan County. Since 1986 it has been a unitary authority. 88 Doncaster & Isle of Axholme 1894- published 2001; in tro by Melvyn Jones. Includes a map of Finningley.